The Aleethia Foundation / A Bittersweet Evening! A bittersweet night! Welcoming many “first timers,” three birthdays, special “toys” for the children and “good-bye and good luck” moments! 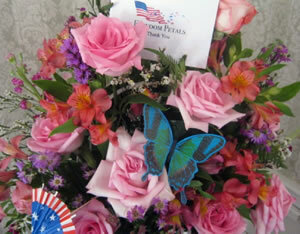 We would like to thank Michele and her many volunteers from “Freedom Petals” for providing unique and beautiful floral arrangements for every table and more. The flowers made the evening so festive and 15 arrangements found their way on the buses back to Walter Reed National Military Medical Center-Bethesda which brought smiles to many. We had to say goodbye to our “Canadian Friends,” Lt. Col. Douglas Martin, Canadian Forces Public Affairs Attaché with the Canadian Embassy in Washington DC and his dear wife, Alexandra. 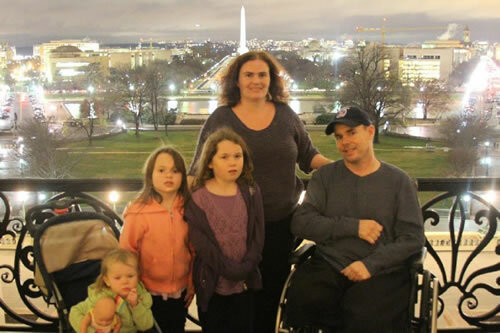 The Martins are leaving their post here in Washington DC to return to Canada later this summer. During their time here, Doug and Alexandra have been wonderful friends to the Aleethia Foundation and the many injured USA service members they have met. 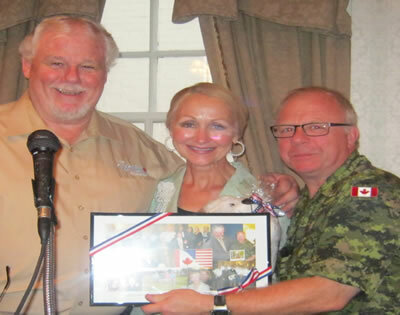 A collage of photos from the “Friday Night Dinners” was presented to Doug and Alexandra for their generous commitment of time, outstanding support and inspiration to Aleethia’s endeavors in the support of the United States wounded service members. We will truly miss you! We wished goodbye and good luck to Sgt Jeffrey Hackett and his family as they begin their transition back to Fort Drum in New York after his 18 month recovery process at Walter Reed.